Lost? Don’t be. Calculating an innovation strategy gap can be attacked in a simple way. Aha! The new year is coming (or coming to an end if you’re just waking up). We’re blown away by the new ideas and tools rolling into town. Keep life simple. And why not. Give yourself a break and learn this simple formula for the things you want to do. Whether you’re doing a full-on innovation program, a one-year marketing plan, or first quarter startup, just get out the gate (figuratively) to release your innovation strategy. Why do you need an innovation strategy gap? It is more than a simple formula. Understanding the gap helps determine the target of your innovation strategy. Are you headed in the right direction, based on projection, target, and gap?Granted, you may extract ideas and this may inspire you. See next, how to calculate the gap. Then grab some tips, and next steps. Target. See where you want to be. It is your target. Where are you when you shoot for the moon? Ha ha. The top of a mountain. Or see where your blue ocean strategy may be. Gap. Determine the gap based on your strategy for innovation. (See light green grass in image above.) Subtract your moon goal or blue ocean strategy (step 2) from projection (step 1). Believe you have a desired innovation goal. Ok, reaching for the stars may do for now. Go back to your strategic plan or business plan. Plug in your variables in the simple formula. 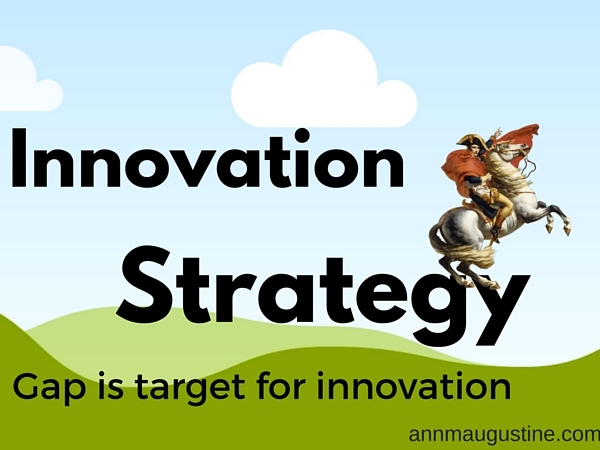 The innovation strategy gap is the target for new innovation efforts. If you found this tip helpful, please let me know in the comments or @annmaugustine.